Humphrey, E. 2011. 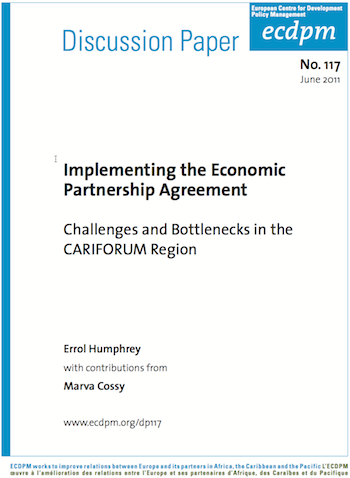 Implementing the Economic Partnership Agreement: Challenges and Bottlenecks in the CARIFORUM region. (ECDPM Discussion Paper 117). Maastricht: ECDPM. Partnership Agreement (EPA), which enabled them to satisfy their obligations to conclude a WTO compatible trade arrangement. The comprehensive reciprocal trading arrangement replaces the one-way preferential access, which the EU had extended to certain developing countries from Africa, the Caribbean and the Pacific in 1975. The Implementation of the EPA has been endorsed by CARIFORUM and the EU. However, formal implementation structures are in place only in Antigua and Barbuda, Barbados, Dominican Republic, Grenada and Jamaica. With the exception of the Dominican Republic case, the EPA implementation and coordination units are constrained by insufficient financial and personnel resources. technical assistance to Member States. There is an EPA information deficit at almost every level in the public and private sectors and this problem is having a negative impact on EPA implementation. Public sector officials and private sector executives do not know enough about the EPA, the provisions of the Agreement and how to access related benefits the provisions of the Agreement. CARIFORUM Governance has also emerged as a major bottleneck impeding progress in managing the implementation of the Agreement. The tardy establishment of oversight institutions continues to hamper the EPA implementation process. The limited amount of Aid-for-Trade (AfT) resources made available to CARIFORUM Member States since the signing of the EPA has fallen far short of what the region anticipated and needs.